No alternative to coal, Fonterra? Really?? Fonterra’s coal use is under scrutiny in South Island media after Robert Spurway, Global Operations Manager, replied on Tuesday to my column in the Christchurch Press. 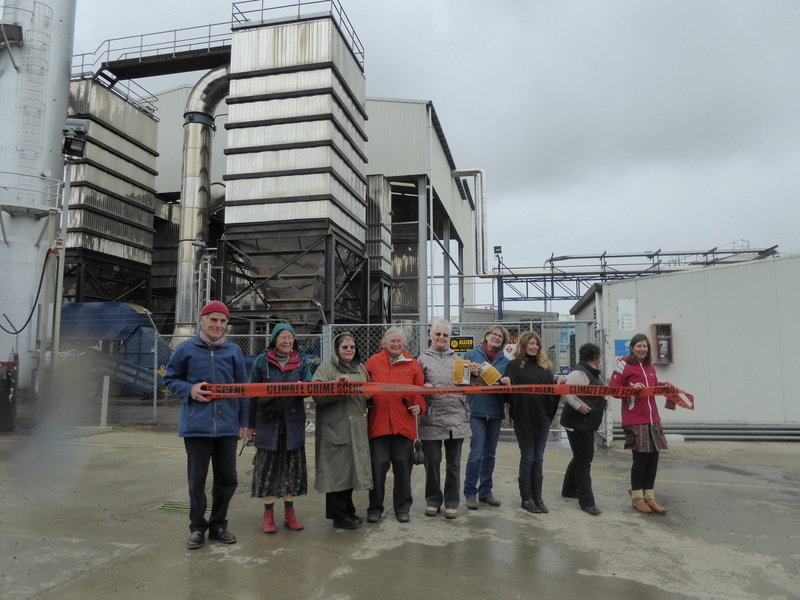 We are calling for Fonterra to use wood waste instead of coal in all its new boilers at its milk factories. Mr Spurway says coal is the “only viable source” of heat to dry milk in the south Island, and begins his arguments by setting up a typical straw man. CANA is not saying that “a switch to entirely wood fired burners would be simple”. Of course it will take some years, and that is why Fonterra should have started yesterday. At the very least, it is essential to start now, with any new burners being designed for renewable fuels. Then the oldest burners, which date from the 1970s and are probably the least efficient, can gradually be refurbished or replaced by purpose-built wood burners. Within the timeframe required for the transition it is likely that new electric technologies will have matured to the point where they can be considered alongside wood. We will bring you more on that in a future blog. But for now, the place to start is the huge volumes of forestry residues that are not being used for anything. Let’s not make the transition harder than it needs to be, by building burners now that will soon have to be changed. Because transition there must be – and soon. Most of the coal that is currently discovered and economic to burn must stay in the ground if we are to avoid catastrophic climate change. This is not an option, depending on how inconvenient it might be – this is the bottom line for the future of our society. Fonterra is planning a ten-fold expansion of its Studholme milk factory near Waimate, all to be coal-fired. Ironically, Mr Spurway is correct when he says that no other wood fired boiler of the size needed at the plant exists in the South Island (though his “50 times” is a huge exaggeration). That is simply because no other company has boilers that large! However, they do exist elsewhere. Initial information about the Studholme proposal is that there will be four boilers powering two milk driers. The combined heat output, including the existing 15 MW boiler, is proposed to be 115 MW. This suggests four new boilers of 25 MW each. The largest South Island wood fired boiler we have seen is 4MW, about one sixth of what is intended at Studholme. However, in the North Island, the Kinleith mill has a wood-fired combined heat and power plant of 40 MW. It works fine. Even larger ones exist in Europe. For example, in Scandinavia, where wood waste is the primary source of industrial heat, there are some of more than 60MW. Fonterra is very proud of its efforts to improve energy efficiency and reduce coal burned per litre of milk dried. We should not be fooled by that. While this progress is commendable, and has saved the company money, Fonterra’s output is growing so fast that, on Mr Spurway’s own figures, even a 16% improvement in efficiency is dwarfed by a 26% increase in coal use to fuel the expansion of the last five years. The climate doesn’t “see” increased efficiency – it only sees increased emissions, and reacts accordingly. The next claim, that the taxpayer-funded free emissions credits amount to “less than 2 per cent of total annual emissions” is, frankly, puzzling. The Ministry for the Environment website records exactly how many free credits are issued to them, and on what basis. The total is 35,123 units, each equivalent to a tonne of carbon emitted. Of course they get no free credits for their transport fuel or their electricity – neither does anyone else. But for the emissions they do have to pay for, they get two for the price of one, like other industry. In any case, the price of carbon under the ETS is so low as to be meaningless. To the outside observer, there is still no sign that Fonterra is “starting to move into more renewable forms of energy” as Mr Spurway claims – and we have been looking for such signs for years now. On the contrary, the company’s coal use has been rising rapidly and will take another jump up if Studholme is built to run on coal. It is good that Mr Spurway recognises that Fonterra has a “responsibility to all New Zealanders for the impacts of (their) decisions”. Those impacts currently include contributing to accelerating climate change, with more severe storms, droughts, floods and sea level rise. Farmers will be particularly hard hit by climate change, and dairy farmers with their huge need for water, even more so. If Fonterra wishes to retain a good reputation and a social licence to operate, it needs to start reducing its carbon dioxide emissions, rather than planning a big increase with new coal boilers.